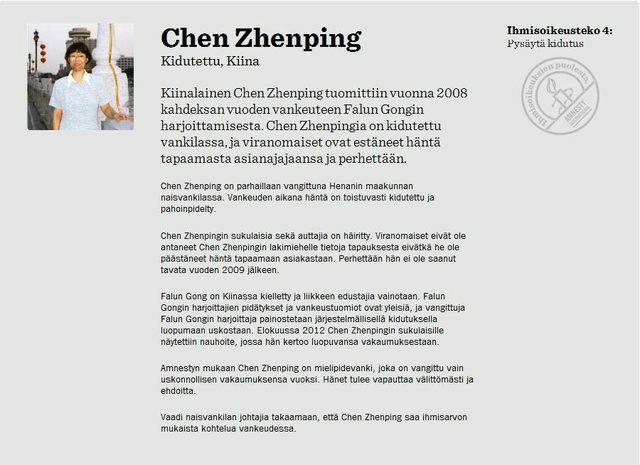 On December 10, 2012, Amnesty International in Helsinki, Finland, celebrated World Human Rights Day by calling for the immediate release of Ms. Zhenping Chen, a Falun Dafa practitioner currently imprisoned in Zhengzhou City, China. The human rights organization also launched a national online petition to help secure her release. In 2008, Jinshui Court in Zhengzhou City sentenced Ms. Chen to eight years in prison for practising Falun Dafa. For the past four years, her lawyer and friends have been prohibited from visiting her. This year, Ms. Chen's daughters—who currently reside in Finland—released shocking video footage of Ms. Chen undergoing forced brainwashing in prison. This has alarmed the international community and many countries are closely monitoring the situation. Amnesty International invited Ms. Chen’s daughters, Zhaoyu Jin and Zhaoheng Jin, to participate in the human rights event held in Helsinki. Both daughters were interviewed, which helped draw attention to their mother's plight. The interview gave voice to the daughters' concerns and helped expose the CCP’s 13-year persecution of their mother. The audience was very moved by the daughters' heartfelt words. During the break, audience members queued up to sign the petition. They told Zhaoyu and Zhaoheng that they were really touched by what they said and hoped that their mother would soon be released. Ms. Chen, 60, suffered from liver cancer and uterine fibroids back in 1995. However, after practising Falun Dafa, all of her illnesses had disappeared. Since the persecution began in 1999, she has been locked up a total of five times: in a brainwashing center, a forced labour camp, and a detention centre. In 2002, Ms. Chen and her youngest daughter, Zhaoheng Jin, were locked up in a brainwashing centre and forced to watch videos slandering Falun Dafa, day and night. They were also repeatedly beaten and locked in toilet stalls. In 2003, Ms. Chen was once again detained. When the prison discovered that she was suffering from myocardial infarction, they released her rather than assume responsibility if she died in custody. However, after being released, Ms. Chen was closely monitored for the next five years. In 2008, right before the Beijing Olympics, she was seized and her home was ransacked. Ms. Chen was later sentenced to eight years in prison and her home, personal property, and business were all confiscated. Ms. Chen is currently incarcerated in the Xinxiang City Women’s Prison in China. 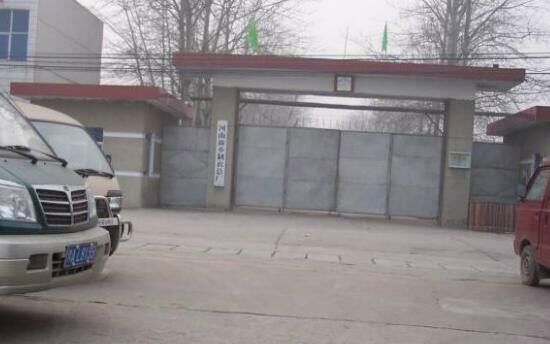 A sign posted near the front entrance gate, however, says, “Xinxiang City Garment Factory.” In effect, the prison enslaves Dafa practitioners and forces them to make garments for over 18 hours a day. The two guards who are assigned to persecute Ms. Chen—Xu Niu and Wenjuan Yuan—have been repeatedly exposed on the Internet for their brutal treatment of Dafa practitioners.